This manual embossing machine is perfect for personalization of ATM Cards, VIP cards, loyalty cards, membership cards and other embossing jobs. All characters correspond to ISO standard with a credit card character set. Embossing quality equals that of any electronic machine. 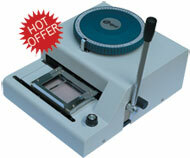 Our embossers have been sold to US, UK, HK, Russia and many other countries.